Guten Tag from Dusseldorf in Germany and the biggest Medical Trade Fair in the World. MEDICA is the world's largest event for the medical sector and it is the first time Kegel8 has exhibited. For more than 40 years it has been firmly established on every health and medical expert's calendar so we are enthusiastic to get the Kegel8 call out to women and men around the world. Guten Tag from Germany & Medica! This week, Kegel8 has ventured out of the office to the Medica Fair in Düsseldorf to show our best-selling range of leading pelvic floor exercise devices. It's going well, (apart from a slight mix up with our stand number when we arrived! ), but we're here and settled now, so if you're at Medica, please pop over to see us in Hall 16, Stand F10-04. 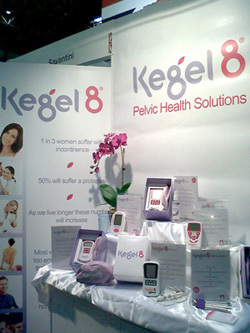 You can come and see our fantastic range of Kegel8 products - because we live, eat and breathe pelvic floor exercise! We are also including some very exciting up and coming new items to our award winning range. We're also looking for International distributors, so come over to see us; we would love to meet you!